Posted September 23rd, 2018 by Mike Boyes & filed under Development of the Self, Early Social and Emotional development, Human Development, Learning, Motivation-Emotion, Personality, Social Psychology, The Self. 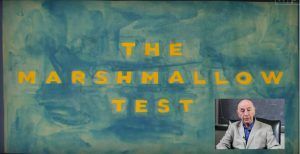 Description: Do you know what the Marshmallow Test is? (No, it does not involve a campfire and smores). The test was set up by Walter Mischel who recently passed away at the age of 88. As described in the video embedded in the article linked below, the marshmallow test, I its simplest form, provides young children with a simple challenge. They are seated at a table and a marshmallow is placed on a dish before them. They are told they can have the marshmallow whenever they want BUT, if they wait and delay enjoying the treat until the adult returns to the room (time varies) then they will receive a second marshmallow for a total of two. How do you think young children do I this task? What do you think it would predict if they were able to wait for 10 minutes without waiting the first marshmallow in order to get the second marshmallow? What sorts of things do you think should be included in this sort of test (Mischel added a few things beyond just presenting a marshmallow challenge)? Think about this and them read the article linked below and watch the video it contains to hear what Mischel himself said about the test. Source: Remembrance for Walter Mischel, Psychologist Who Devised the Marshmallow Test, Julie Carli, NPR. Walter Mischel produced a LOT of research over the course of his thoughtful and prolific career. The great empirical debate he was involved in was concerned with whether or not people’s personalities are fixed or whether they are open to change or to personal manipulation or improvement. The often stated (erroneously) finding from the Marshmallow test was that children who were able to delay gratification long enough to get a second marshmallow, went on to ore productive/successful lives than children who could not wait. In fact, Mischel was NOT a theoretic supporter of a “carved in stone” approach to personality. In his original research with the Marshmallow test what he showed was that if he taught children strategies for putting off eating the first marshmallow AND if they deployed those strategies effectively, THEN they were more successful in life. Walter Mischel believed and demonstrated empirically, that personality change and change for the better are possible. Thank you Walter. What does the Marshmallow Test show us? How did Walter Mischel think and talk about the idea of personality mailability and what did his views suggest?